Welcome to Pinkus Family Chiropractic in Manchester! We offer a modern, open, inviting environment for all ages. 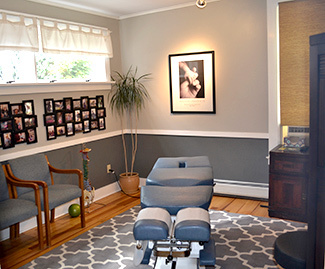 You can relax in our living room by the fireplace before seeing your chiropractor, taking a look at the family pictures on our wall or the photos of local athletes who have sought our help. The necessary new patient forms can be found on our website and brought in with you completed. After you arrive, you’ll have an office tour, then watch a brief video that will explain what you can expect. All new members will then meet with Dr. Katie for a consultation. Next, you’ll have scans done of your nervous system health with the Insight™ Millennium Subluxation Station. You’re then done for the day, and we’ll schedule you for a follow-up appointment. This visit takes about 25 minutes. At your second visit, you’ll have a report of your chiropractor’s findings and your first chiropractic adjustment. We’ll provide you with a folder of educational materials, including cards to refer your friends and family for $20 off. This appointment and all subsequent ones take about 10-15 minutes. You’ll have scans re-taken every 12 visits to ensure that you’re progressing, gaining more of an education about chiropractic care along the way. Often, people put up with pain or sickness for years before seeking our help. Once you’re free from discomfort, you’ll quickly realize it when and if it returns. Regular adjustments are a simple way to ensure that these problems don’t occur again. If you choose, you can come back periodically to stay well and prevent further issues. Schedule your time with us today! Insurance coverage can be used at our office.